With and real, is a real polynomial with three roots: and . 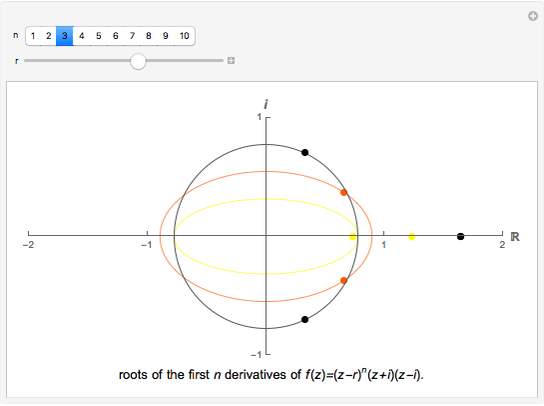 This Demonstration shows the roots of , , …, . Each of these derivatives has at most two nonreal roots (depending on the value of the real root ). 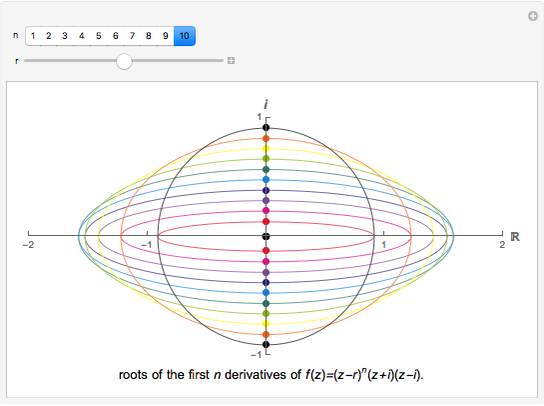 As varies over the reals, these nonreal roots trace out ellipses in the complex plane. The nonreal roots of the first derivative lie on a circle, while those of the higher derivatives lie on successively narrower ellipses. 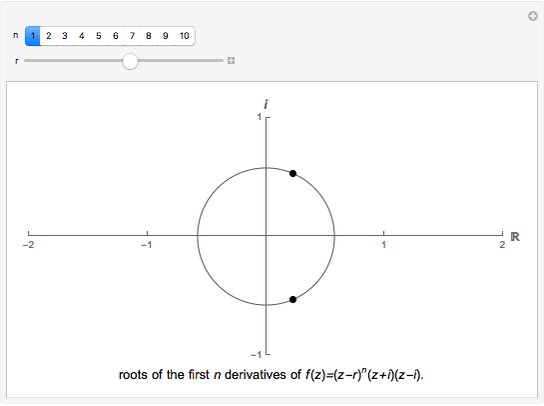 Set the value of , and slide along the real line to see the roots of the derivatives move in real time. This problem came out of an undergraduate research project conducted at Randolph-Macon College in 2006. The ellipse associated with the derivative has semimajor axis and semiminor axis . Further investigation showed that these results could be generalized to a broader class of polynomials. These results have been submitted for publication in the Pi Mu Epsilon Journal. The interested reader might also enjoy the article "Roots of polynomials and their derivatives," by Bruce Torrence. It appeared in Mathematica in Education and Research (10) 2, 2005, pp. 71-80. Liza Lawson and Bruce Torrence "Roots of the Derivatives of a Certain Real Polynomial in the Complex Plane"